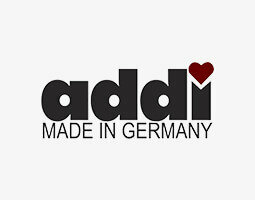 As a family company, Addi has been producing knitting needles and crochet hooks for 187 years in the German town of Altena, and the company is now led by the sixth generation. In doing so, Addi creates jobs here and ensures that you can trace the origin of our products. Addi is the only European manufacturer with a complete assortment. This has become an important point for many customers in today’s globalized world. Addi Classic, Bambus, Olive Wood, Aluminum, Click, Colibri, Champagne, Swing, Flexi-bel and a lot of accessories in the range. For knitting needle's products, Addi offers 2 type of knitting's tip to knitters, a very sharp tip for socks, gloves, shawls and all lace and fine yarn-weight yarn projects. And the normal tip for bigger size yarn-weights. For knitters who love to work with natural materials; Addi Bambus and especially Addi Olive Wood are the perfect choices for your knitting time. Addi Swing, Swing Maxi, and Swing Mini ergonomics crochet hooks are the great choices for the crocheters who need to work hours for your projects. Feature more, you can find the wide range of Addi's products such as Addi Flexi-Bel; flexible knitting needles, interchangeable circular sets, circular Tunisian and lovely accessories such as a heart-shaped stopper, stitch stopper, stitch marker and etc. And trustily purchase them on Hobiumyarns.com.